Congrats to Hollie -- she won the AOA's NCAA basketball tournament pool. She gets a $25 gift certificate to the Recovery Room. 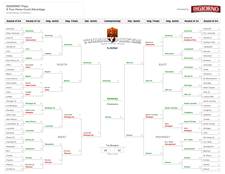 Hollie correctly picked 46 of the tournament's 63 games. She also had three of the Final Four teams (she had Michigan State instead of Louisville), and correctly picked the final matchup (Kentucky over Kansas). Her winning bracket -- which was in the 99th percentile for all the brackets on Yahoo -- is posted after the jump. Hollie's winning bracket is at the top of the page -- scroll all the way up. Thanks AOA! These brackets are always funny to me. I just picked my alma mater (USF), former employer (Purdue) and then everyone else was ranking, gut feelings, & school most likely to celebrate inappropriatly if they won.